I'm sure there are people out there who scoff at the idea of "decorating" a boat. Certainly the saltiest sailors of our time - Slocum, Mortissier, Johnston (all whom I love and admire) - cared very little about aesthetics when they were journeying... A boat, after all, is made to perform and safety and integrity should always remain top priorities. While I wish I had a little more of the rugged adventurist who could care less about fluffy things such as "decor" in me, I will say that I do not. I'm spontaneous and adventurous and up for a challenge, but I still love and crave certain creature comforts; namely I like the place I live to look nice and tidy and to feel inviting and homey. 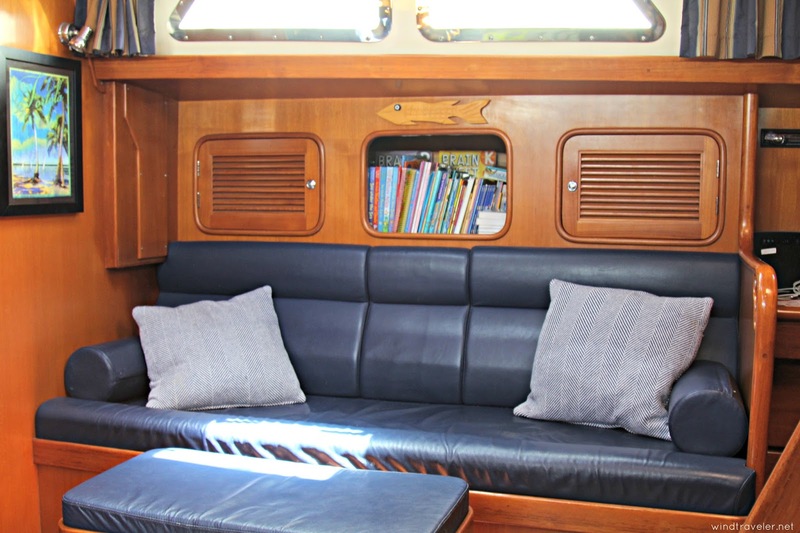 When living on a boat or tiny home, however, the key is to enjoy these things while still being functional. Believe it or not, there are ways you can beautify your boat without spending hordes of money and sacrificing performance... 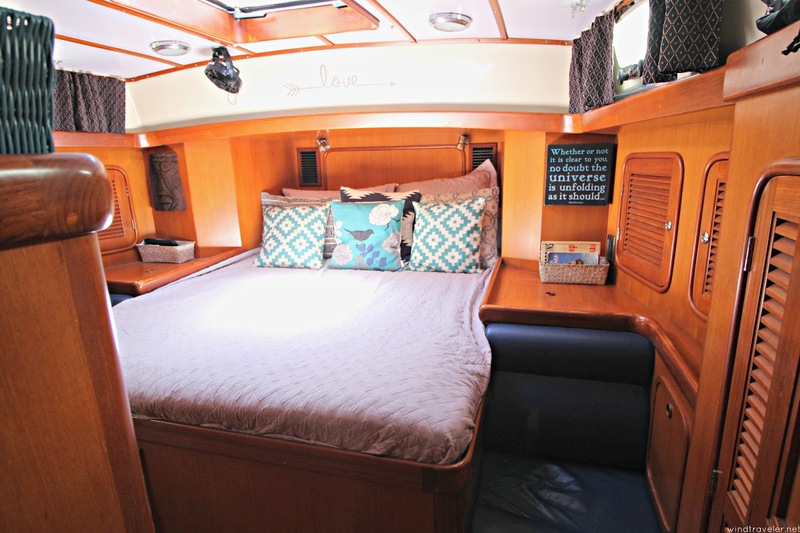 Throw pillows, wall art, and rugs are the three easy ingredients and with a little planning, your boat can look nice and cohesive with minimal effort. I've written before about >>> making a boat a home <<< , but it's been a few years. Because >>> we have a new boat <<< now and my style has evolved, I have a few more tips and products to share for those fellow live-aboards and cruisers who, like me, prefer their boat to feel (and look!) like a 'home'. 2) Pick a color palette: This is the fun part! We love color! Check out these tips for picking a color scheme and then go generate one easily with this online tool. We chose a bright color palette that was largely dictated by colors in art we brought from our old boat and the navy blue of our cushions. Keeping the color scheme - whether it be muted and soft (beige, baby blue, gray), or colorful and bold (bright blue, green, turquoise) helps to keep the decor cohesive. 3) Incorporate pieces that coordinate but stand out: Large patterns on bedding and cushions are tough on a boat because they can make an already small space feel smaller, we really like sticking with our cushions/bedding being a solid, plain color and incorporating bold patterns in with our decor like pillows and rugs. Throw pillows and non-skid floor matts are a really easy way to bring color and patterns into a boat. 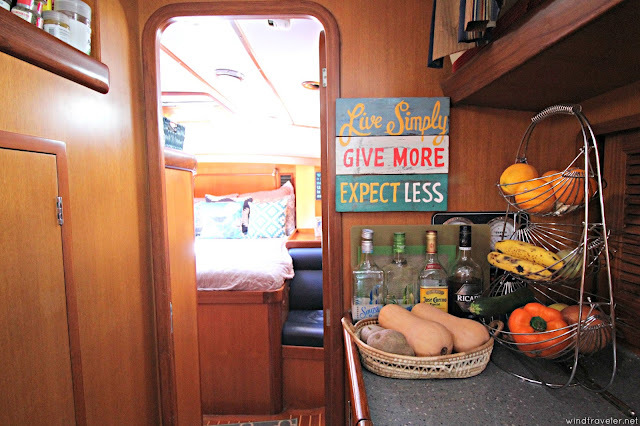 4) Utilize wall space: Because there is very little counter space on a boat, we have utilized wall space to decorate our boat with pictures, art, and decorative wall storage pouches to keep clutter at bay. 5) Look at the big picture: A boat is small and there isn't much separation from space to space so our whole boat is more or less decorated within our color palette. We use pillows, rugs, and photos to decorate our space which are easily swapped out and changed if we feel like redecorating. A lot of our pieces can also be switched from space to space if we feel like changing things up a little. 6) Don't forget functionality: Don't ever forget that a boat's purpose is to go sailing. This means that you must consider whether or not something really makes sense to bring aboard. For example, a vase in the center of the table is probably a bad idea, as it will most likely become a projectile when underway. We try to keep our boat as "sail ready" as possible so most of our decor is either secured to the boat or easily tucked away. We can be off the dock in no time, and that's how we like it. 2) Scout Rump Roost Medium Bin: I am obsessed with all things Scout! 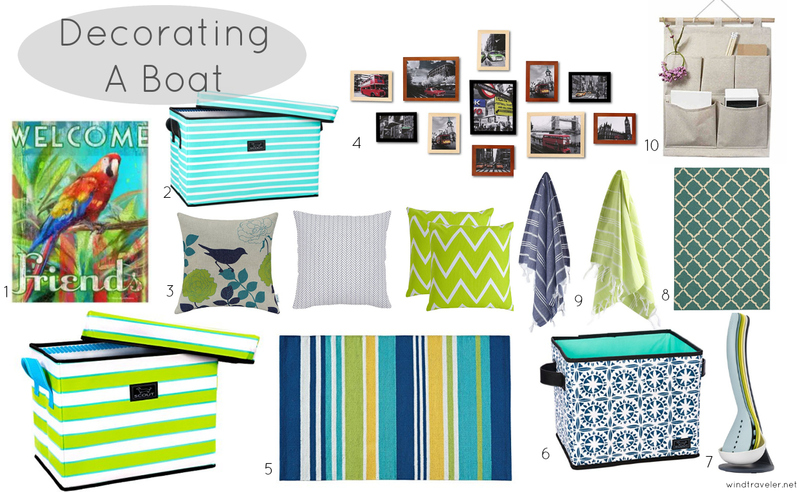 We have four of >>> these bins <<< in our boat (both styles depicted on this inspiration board) and they are where our toys, spare linen, and the girls' dress up clothes live. They look super nice, fold flat, and - the best part - are water proof and sturdy enough to stand/sit on. Because space is at such a premium on a boat most - if not all - items should serve two purposes and these fit the bill perfectly. 3) Throw Pillows: I'm not sure if there is anything that causes more husband/wife discord than the number of pillows in a home, but in my experience, men see no point in these things. 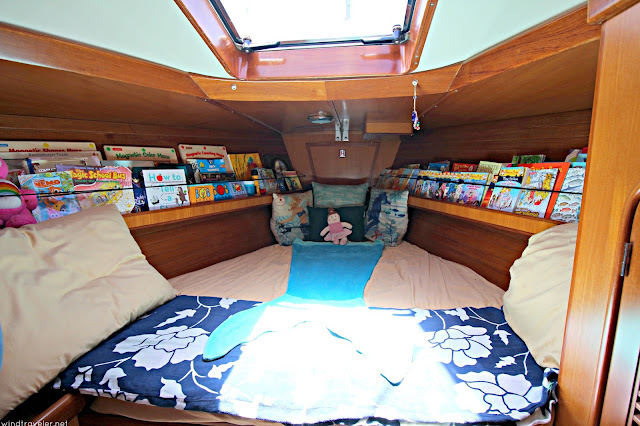 And, okay, they might be a tad superfluous but I love me some throw pillows and while Scott has put a strict moratorium on me buying any more, I think they really spruce up our boat and the girls love making forts with them all. Dual purpose! We got most of ours on from Amazon where they >>> have an awesome and very affordable selection <<<. 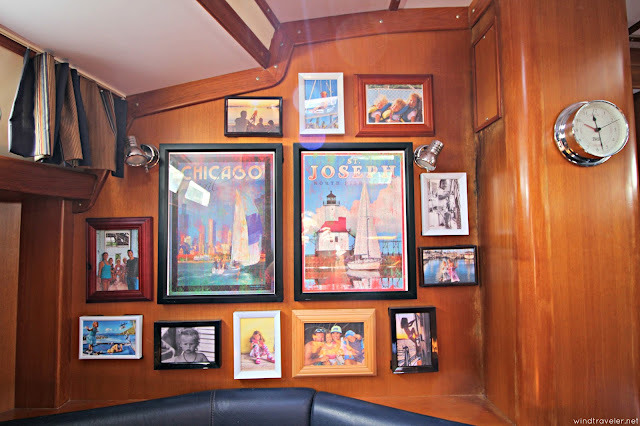 4) Gallery wall: This is my favorite feature of our new boat. 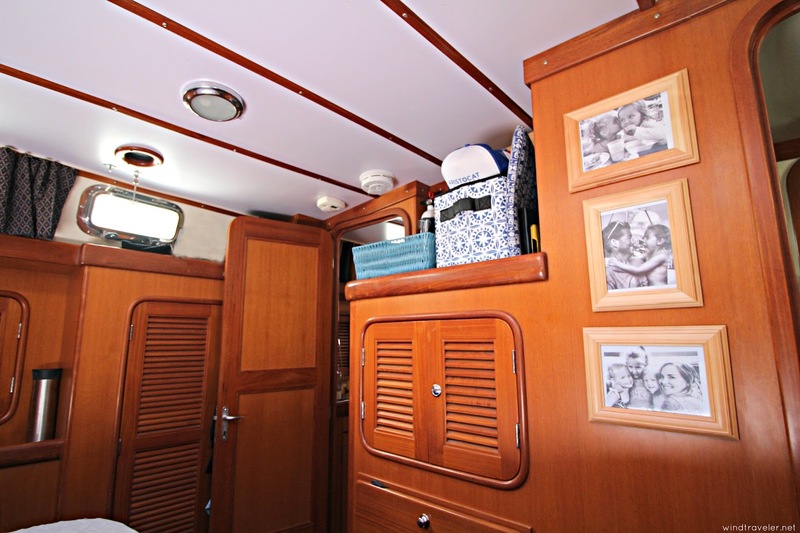 I have always wanted a 'gallery wall' of family photos and we finally had the space for it on our Tayana. I mix and matched frames similar to >>> this set <<< ,and printed out some pictures. Everyone who comes aboard loves peeking at the pictures and I think it looks so nice and inviting as a main focal point in our boat. 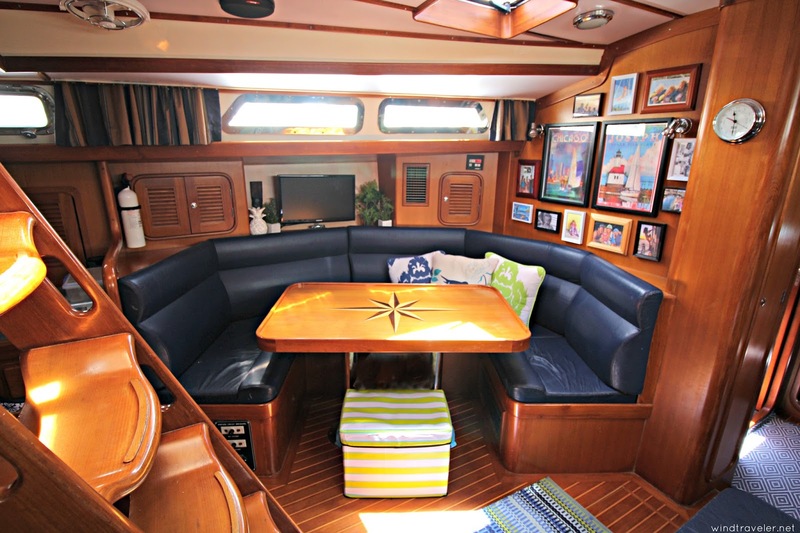 5) Throw rugs: We have seven throw rugs on our boat. They make a huge difference in the look of our interior and I'm always on the hunt for >>> good ones <<<. Most of ours are indoor/outdoor rugs that are stain proof and easily cleaned, and we have non-skid mats underneath all so they don't slip. 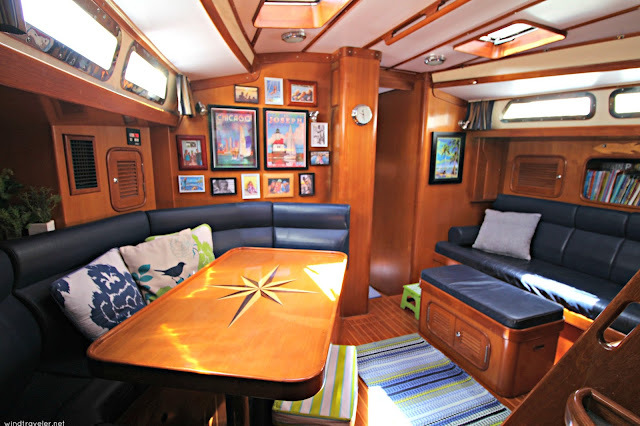 One thing that is tricky with rugs is that boat spaces are usually more narrow and don't fit regular sizes. What I do is measure the space where I want a rug to be, and then I go to Amazon and do a search for a rug of that dimension. It's worked well for me and you get more choices and styles. You could also have a rug cut down to size and bound by a professional. 6) Scout Hang Ten Bin: Another >>> Scout product we love <<<. We have about six of these in our boat and not only do they look nice, but they are sturdy and hold a lot. These bins are in our larger lockers to hold clothes and you will see one in the picture below in our bedroom holding my obscene multitude of trucker hats (the struggle is real). 7) Coordinating the galley: Because our saloon runs right into our galley, I've kept the decoration there in the same color palette. 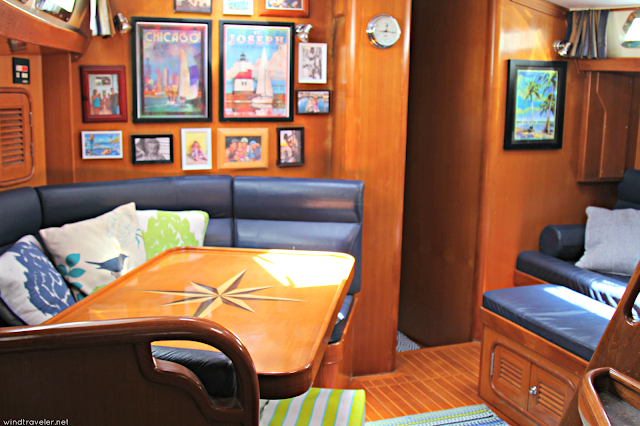 The pot holders, dish towels and most of our dinnerware coordinates with the other elements in our boat. These >>> magnetic nesting cooking utensils <<< were an awesome find because not only do they look nice, but the next together magnetically and take up zero drawer space. 7) Non skid mat: as I mentioned above, throw rugs are your friend. These >>> non-skid mats <<< are very durable, stain proof and have been on our boats from day one. The nice pattern is a big plus and they are small enough that they'd fit in just about any boat interior. 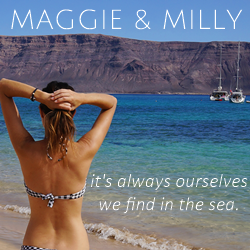 8) Turkish Towels: We love turkish towels on our boat and use them for the bath, beach and pool. We also use these >>> Turkish hand towels <<< for our dishes and they look nice to boot. 9) Wall organizers: I cannot stand clutter (hard to avoid with three kids but still...) and prefer a minimalist, airy and open feeling. We have four of these >>> wall organizers <<< in the girls' rooms and in both heads (bathrooms) affixed to the wall with industrial velcro and they look stylish and store things in an nice, organized way. 1) Industrial Strength Velcro: We love this stuff on our boat and keep a >>> giant roll of it <<<. It is what we use to affix all our art and photos to the walls without having to drill holes into our boat. 2) Museum Putty: While we try to keep our counters clutter-free from projectiles that might go flying underway, we do have a few trinkets out here and there. >>> Museum Putty <<< makes sure they stay put. 3) Command strip anything: I love command strip hooks! We have three or four of >>> these hooks <<< behind every door and they hold towels, bags, hoodies and other stuff freeing up space in our cubbies and drawers and keeping clutter out of sight. Those are our tips! What tips do you have for decorating a small space? Please share as we are always evolving over here and looking for new ideas. In the meantime, here is our space and what it looks like. I hope you enjoy! Here you see some more photos as well as bins I use to store my camera accessories as well as my trucker hats. Our walk-thru galley. Everything still flows nicely to the back and front of the boat. Another piece of art, velcroed to the wall. For the wire fruit basket we will have a hook drilled above it that a piece of bungee will attach to for rougher passages to ensure it doesn't fall over. 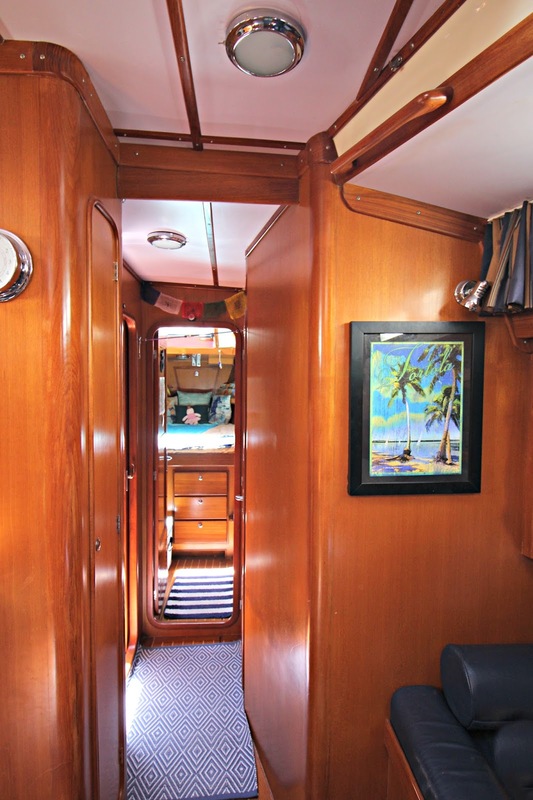 Another view of our saloon, the main living space in our boat. 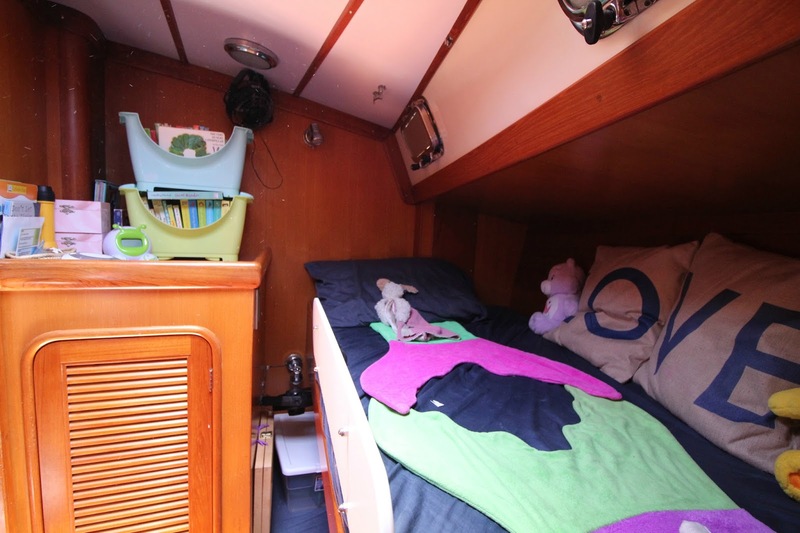 Looking at our saloon towards the kid's berths. The ottomon is more toy storage and I aboslutely love those super soft herringbone print pillows. There is a fiddle that goes across the book shelf so books do not fall out, but we remove it when we are docked so it's easier for the girls to get books out. I could not resist the pinapple, it (along with the tiny fake plants) are super light and secured with museum putty. 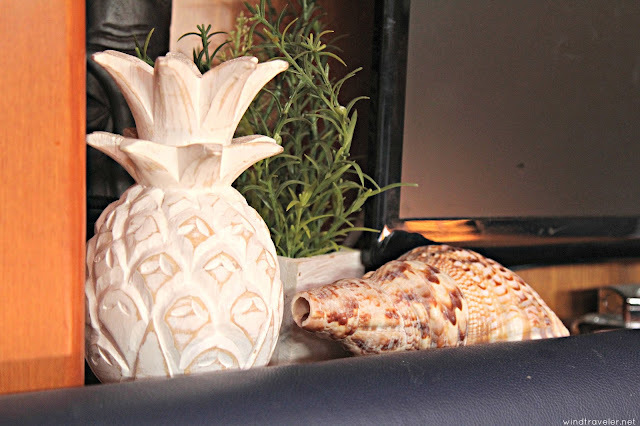 And who can resist putting out their shell horn for decor? The gallery wall that I love so, so much. Pictures are also easy changed out. Again, secured with industrial velcro so no holes. Looking forward to Isla's room. You see our newest piece of Patrick O'Brien art and some more rugs. 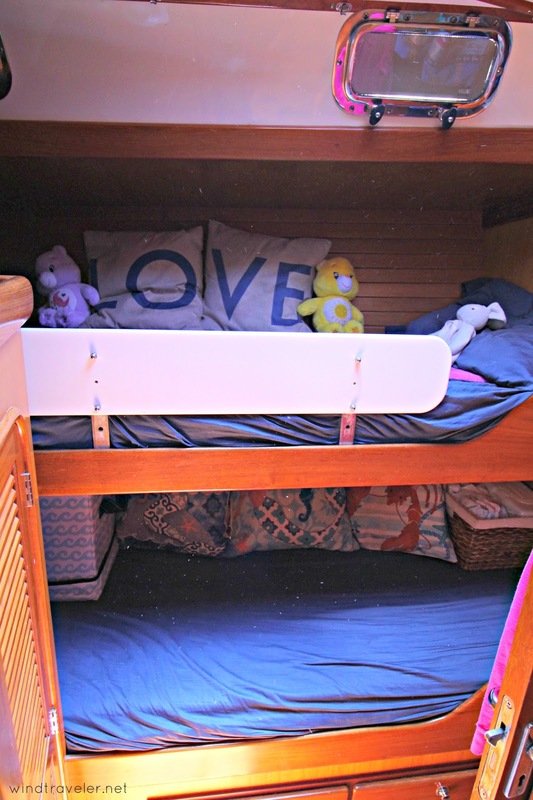 The twins's top bunk. They sleep up there together, by choice, despite having a bunk each. Their books are stored in bins. Another view of their room. 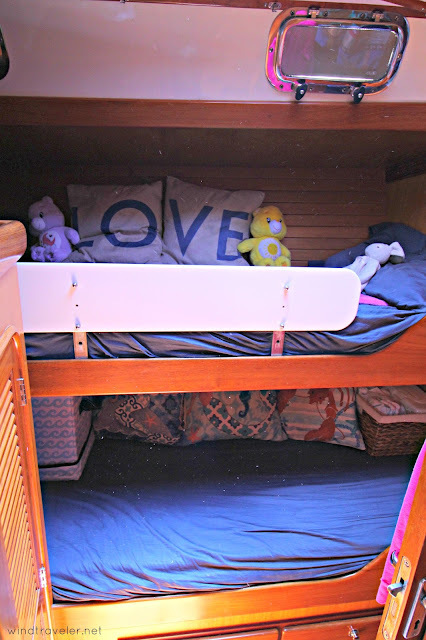 You can see a Scout bin on the bottom bunk for their stuffed animals. Isla's room which is FULL of books! The super strong bungee running the length of the shelves prevents them from flying out when we heel over. Lovely, it looks so homely and practical. I kept thinking of putting more pictures up, completely inspired now thank you! 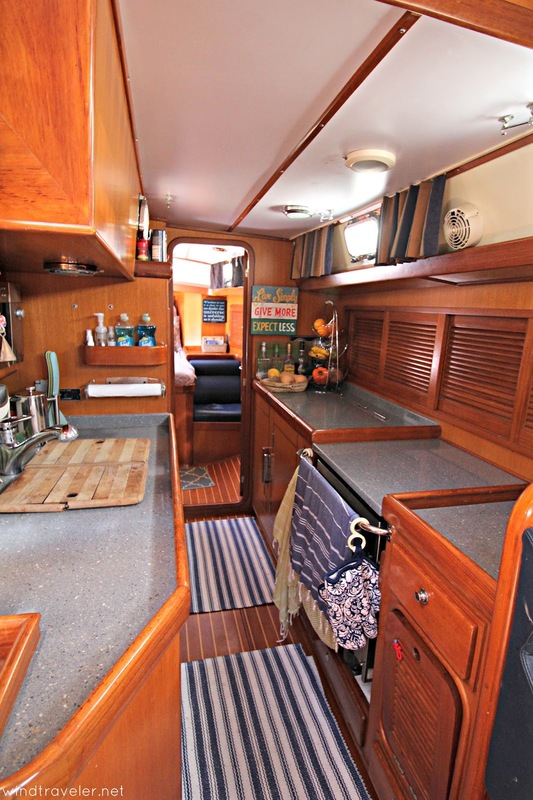 I'm looking into downsizing (to a sailboat maybe)? This was super helpful. Thanks! You were married in St. Joe?! I was born and raised in Berrien Springs, about 15 minutes away from St. Joe. 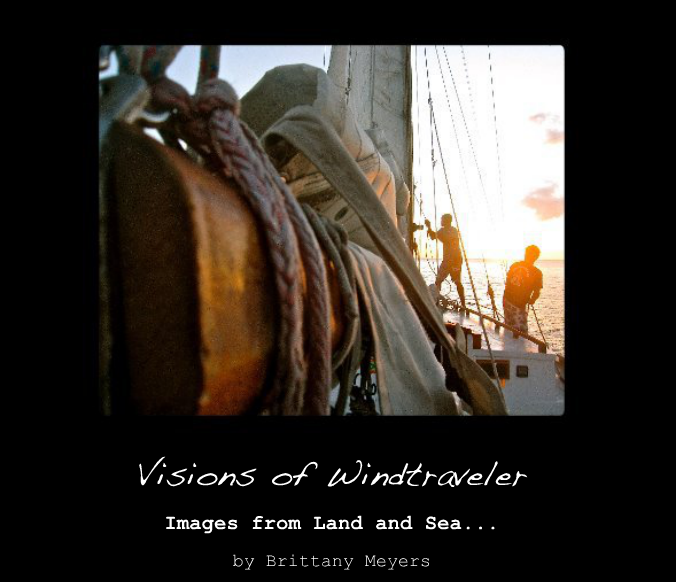 Growing up on Lake Michigan helped me develop a love of water. I now live on the other side of the lake (south of Green Bay) and we are planning on moving on to a boat for the summer next year with our almost-2 year old and 6 year old. 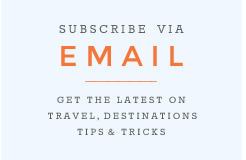 I love your blog for some sound advice! Highly recommend electrical contractors south jersey. Kept me informed about his arrival time and was able to meet my needs quickly and efficiently and at a fair price. I actually enjoyed this service call. Sullivan Electric Company will now be my electric service company of choice from now on! These were truthful about their work as well as pricing, and their workers were nice and expert. They respected our house and handled this carefully. VKB Kitchen and Bath is great. They understand their own business; they can have suggestions which resulted in a better design. I would recommend them VKB Kitchen and Bath Columbia business…. If you would like dependable, fast and economical service for your water seepage problems, contact Indigo Building right now! I possess recognized the Water and Fire Damage Restoration Portland personally for some time and they're extremely expert as well as certainly, the best from what they do. I highly recommend Indigo Building.